DR. ARNOLD COLVIN rose, sedately, from his knees and carefully dusted his immaculately-creased trousers. For some time he stood gazing at the open safe, his fingers plucking nervously at his full, red lips. A few yards away stood Mark Frost, Detective-Inspector of New Scotland Yard. Still further back clustered in the doorway a group of polite officials, gazing curiously at the little man who, in a few years, had won an international reputation in the area of crime-detection. Seated at a large desk in the centre of the room, his elbows on the blotting-pad, his large hands supporting his chin, was Sir Geofrey Farrington. Over all there hung a sense of tense expectation. "What do you make of it, doctor?" asked Frost abruptly, breaking a long silence. "I would like to know exactly where Siti Ram is." The little man spoke meditatively, almost to himself. "Siti Ram!" The Inspector was startled. "Who is Siti Ram?" The United States Secret Service operative did not reply immediately. He turned to face the big man at the desk. "Perhaps Sir Geofrey can give us some information," he said. Sir Geofrey moved restlessly, and nodded. "Siti Ram is one of the most dangerous men in the world—and the greatest coward." The words were spoken almost reluctantly. Colvin nodded. "It is because of his cowardice that he is most dangerous." For a moment he paused, then turned to the Inspector. "More than half the murderers, as you well know, my friend, are great cowards. They strike in a frenzy of fear, for the moment forgetting the greater fear that will possess them for days, perhaps months, because of that moment's fear." The Inspector nodded briefly. "This Siti Ram," he questioned. "This is the first I have heard of him." "Siti Ram is a baboo—from Delhi. A man of medium height, a mass of loose waddling fat, habited by a brain so keen and alert that he has always managed to keep himself in the background of the crime he plans." Colvin paused. Again he turned to the man at the desk. "When did you last hear of Siti Ram, Sir Geofrey?" "How did you know I had heard of him?" The millionaire spoke quickly. A moment's hesitation and he turned to a drawer in the desk and pulled out a card, flicking It across the desk-top. It was Mark Frost who pounced on the card. The gilt-edged, glazed surface bore only the designation, in ornate type; "Siti Ram, failed B.A." "This is the first time I have heard of this man," Inspector Frost spoke angrily. "How did you come to forget this, Sir Geofrey?" The big man looked up, calmly different. "I found that card on my desk this morning," he answered. "I never before now connected it with the theft of the Pearl of Peri." "OF course, he lied!" Inspector Frost spoke abruptly as the two men walked away from the house in Park Lane. "But just why, I cannot understand." "No?" The little man, taking three steps to the Inspector's one, pursed his baby-shaped lips. "Yet there are many people In this world who choose to forget Siti Ram—when he leaves his card on them." "A coward!" The detective sneered. "What is a coward?" The thin, light voice of the American spoke coolly. "You forget, my friend. Many of the bravest deeds In history are the result of momentarily cowardice—even the performers admit that." Inspector Frost passed the remark. After a moment he spoke, meditatively. "Then we have to run down Siti Ram." he paused. "Well, from your description that should not be difficult. He cannot leave England." "But—" Frost stuttered. "The Pearl of Peri was only stolen last night." The Inspector did not reply. There had been an inference in the American's tones that had conveyed a wealth of knowledge. Unconsciously he lengthened his stride. In his mind was the purpose to get back to the Yard and put out the call for Siti Ram. With a few tremendous strides he suddenly remembered his companion and slackened his pace, looking down to his side with an apologetic grin. To his surprise Dr. Colvin was not there. He halted and looked back. The Secret Service operative was not in sight. DR. ARNOLD COLVIN was glad to be alone. When Inspector Frost had telephoned him the news of the robbery of the Pearl of Peri, he had gone direct to Sir Geofrey Farrington's house. He knew that he was again on the trail he had lost many months before—the trail of the twelve most remarkable jewels in the world. In that cool, quiet library in Park Lane he had read an open book. From the moment he had passed into the house he had realised that there lay much that he must learn. He had listened in silence to the brief, workmanlike reports of the detectives. Never for one moment had his eyes left the huge form of the millionaire. Gradually had grown in his mind a thought he would not at first credit. As time progressed he knew that his first thought had been correct. Sir Geofrey Farrington had lied; he knew far more regarding the loss of the jewel than he had already told. Then, on the door of the safe, he had seen a strange mark. A duplicate of that mark had appeared on the baboo's card, flung carelessly on the desk by the house's master. Siti Ram was in London, or had been. A queer, strained smile came into the American's eyes as he visualised his opponent—the fat man he had only glimpsed once, many years before. Yet he knew; Siti Ram had been in London the previous day—perhaps he was still in the metropolis, but Colvin did not think that likely. Where was the man now. The whole wide world lay open to his search—and Siti Ram was a genius—and a coward. The momentary distraction of the Scotland Yard official had opened a way of escape. Later, perhaps, he would find use for the detective who had long been his friend. At the moment he longed to be alone. A narrow alley, between two rows of high houses, had offered opportunity. The alley led into a broad road and, luck of lucks, a cruising taxi was crawling down the road in the direction Colvin wished to proceed. The American smiled secretly as he was swept towards the heart of the city. He had a call to make—a visit that might perhaps put him on the trail he sought. Before a tall, narrow house in Moorgate-street the taxi came to a halt. Colvin alighted and paid off the man. Entering the house, Dr. Colvin tolled up the steep stairs to the top floor. There he opened a stout oak door by means of a tiny key attached to his watch-chain. Had Inspector Frost, who continually boasted of the complete and intricate system of crime detection possessed by Scotland Yard, been in that small room, he would have marvelled. For more than an hour Dr. Colvin sat at the desk, the telephone before him, putting through call after call. At length, he pushed the instrument from him. His feet came up to the desk top; the chair tilted hack to a comfortable angle. From a pocket came a tobacco bag and papers. Dusting a line of tobacco on a paper, the little man's agile fingers of one hand rolled a cigarette. A lighter flicked to a flame. From the delicate, womanish nostrils floated a stream of sweet-smelling smoke. For more than an hour the little American sat smoking, almost without motion, except for the agile fingers that rolled cigarette after cigarette, or lit the lighter. Then the telephone rang compellingly. In a moment the Secret Service operative was alert. In silence he listened to the voice at the other end of the line. Then, with one finger he depressed the hook for a moment. Allowing the hook to come free, the American dialled a number. "Siti Ram, I want you." BRIXTON ROAD is very cosmopolitan in many characteristics. In its long range of houses; in the houses bordering the narrow streets opening from it, live many nationalities. Mainly the foreigners living in these houses call themselves students—students at innumerable schools which profess to diffuse divers cults, sciences and "ologies." There are art- schools, with their attendant quaintly-garbed and -groomed enthusiasts; there are "students" of lores carefully kept from the knowledge of those in authority. Within the inner recesses of the warren of houses around Brixton Road live those who only emerge at long intervals to contribute to the gaiety of newspaper readers—to retire again into a self-seeking oblivion. Fedora Street boasts of its quiet respectability. The only vehicles that travel it are tradesmen's carts. The great majority of houses are let in rooms; and mainly to students of foreign appearance. One peculiarity it possessed. In comparison with the surrounding streets it possessed a greater quota of telephones. It is possible that many of its inhabitants would have sought fresh fields, but for this. Telephones are necessary where quick, unobtrusive movement is indispensable. Thirty-five minutes in a somewhat dilapidated taxi brought Dr. Colvin to the corner of Brixton Road and Fedora Street. He dismissed the vehicle and stood for some time as if lost in thought. Yet his eyes did not miss the keen, secretive glances of the man who strolled out of the by-street into the main road. He smiled secretly. Siti Ram was well served. Waiting until the man passed reluctantly out of sight, Arnold Colvin walked slowly down until he came to a house bearing the number "7." He had idled on the way, for he wanted the watcher to reach a telephone and make his report to Siti Ram before he knocked at the door. Years past, he had learned the value of his unaggressive personality. For a brief second he waited at the Iron gate that guarded the "front garden," as the patch of waste-land before the house was suggestively called. He glanced up at the building. It was of only three storeys, the first and second storeys having sheltered balconies before the windows. Colvin almost thought he could detect the bright eyes of a watcher surveying him from one of the first-floor windows. That would be Siti Ram. He walked up to the front door and smiled at the ornate brass plate close to the brass bell-push offering on behalf of Professor Serge Martivitch instruction in any of half a dozen various musical instruments, at very moderate fees. "Mr. Sadeli?" Colvin removed his soft hat at the appearance of a frowsy woman with a coarse apron twisted about her waist. "I dunno if he's in." The woman stepped back and sent her shrill voice echoing up the stairs. "Mister Sa-del-e-i!" As the woman turned, Dr. Colvin passed her in the doorway and started to mount the stairs. The woman went to follow him, then hesitating, shrugged, and waddled to the basement stairs. Her attitude showed that she considered that if there was any possibility of trouble the less she knew about it the better. The Secret Service operative mounted the stairs leisurely and made for the door of the large double room extending across the front of the house. As his knuckles drummed on a panel his tight hand stole to the door-knob, turning it silently. The door gave. Like a passing, swift shadow, Colvin entered the room, closing the door behind him. The room was empty; yet Dr. Colvin was certain that, as he had arrived before the door in the passage, someone had passed from it to the balcony. For a moment he stood, his eyes searching every nook and corner of the room. Seemingly satisfied with his survey he walked across the room to the balcony windows. One of them was open, and he avoided it, going to the closed window. As his fingers touched the fastener he whirled round, dropping to his knees. His keen ears had caught the swish of silk drawn rapidly through the air. "The cult of the handkerchief, Siti Ram?" Colvin laughed gently, drawing himself upright before the gross fat man who had entered silently from the balcony through the open window. From the nervous fingers he caught gently a piece of fine Indian silk. "The fear of a coward." Colvin carefully dusted the knees of his trousers, "is that the fear that drove you to kill me?" "Oh, no, Sahib. Positivelee not." For a moment the Secret Service operative gazed in the eyes of the fat, dark-skinned man. "I think I shall call the police and give you in charge, Siti Ram," he said. "Because you failed." The American smiled. "Sit down, Siti Ram. You've got to talk now. What are you doing in this country; you're no credit anywhere, you know." 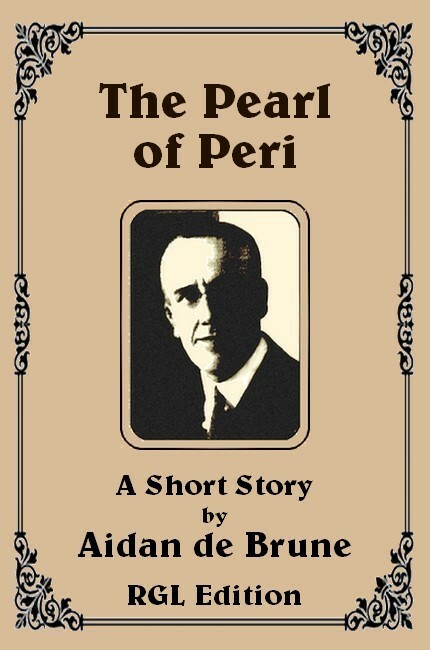 "Sahib, in pursuit unavailing of chance emolument—"
"The Pearl of Peri, in fact." "My God, Sahib, I am innocent of all complicitee in this or any other eventuality, I am married man, having family responsibilities and of other handicaps—"
"What were you doing in Park Lane last night?" "As peaceful citizen in pursuit of daily bread and other perquisites—"
"Including the Pearl of Peri?" Colvin laughed. "I do not understand, Sahib." "No?" The Secret Service man rose and pulled down his closely buttoned jacket. "Let me tell you, Siti Ram. Last night someone broke into sir Geofrey Farrington's house in Park Lane and stole the Pearl or Peri. Fortunately they missed—"
He paused, his bright blue eyes searching the baboo's face. The man was seated on the narrow bed in a dark corner of the room, yet, for the instant, Colvin could see the question in the half-veiled eyes. "You are not asking questions?" The little man laughed. "Perhaps you'd like to explain how you came to be in Park Lane so late last night?" "Oh, that." The Indian's soft voice spoke from the gloom. "That is very simple told. There is nothing outward in that connection. I walk." "Walked into the house and took the Pearl of Peri. Well, you missed. As I've said. Sir Geofrey is not so innocent. When he acquired that pearl he had the sense to have a duplicate made. It was the duplicate you stole. The pearl's safe—quite safe." As be spoke the American rose from the chair on which he had been seated and turned to the door. As he pushed the table in the centre of the room his hand hovered over it for a moment, leaving there—something. On the threshold of the room he looked back. The baboo was still seated in the dusky corner of the room; his hands folded in his lap; his eyes cast down. "WAIT!" Dr. Colvin spoke in an undertone. With Inspector Frost and Sir Geofrey Farrington he stood in the latter's library. "I'm guessing, Frost, that something will happen shortly—but just what I'm afraid I can't prophesy. I saw Siti Ram and gave him something to think over. But—"
"You tracked that baboo?" The detective spoke incredulously. "That wasn't difficult." The American laughed quietly. "Y'see, Siti Ram wanted me to find him." He would explain nothing further. Autocratically he demanded implicit obedience in return for his help, only promising that at some time during that night their problem should be solved. Slowly the hours sifted on, broken only, in that dark room, by the infrequent street-noises that drifted in through the open window. Then slowly, before the door, grew a denser shadow. Frost tensed, to feel Colvin's hand on his arm, restraining him. The shadow moved, gliding stealthily through the room, halting again and again, as if listening; as if searching the darkness with eyes that could see. Slowly it advanced until it stood before the big safe let into the far wall from the windows. Then, suddenly it disappeared. "The Pearl of Peri is not in that safe, Siti Ram." The American spoke softly. As he uttered the words his fingers depressed the light switch, flooding the room with the dazzling brilliance of many globes. Before the half-opened safe stood the baboo, fear glistening in his small black eyes. Like a cornered rat he glanced from one to the other of the three men who faced him. "Siti Ram," the American crossed the room until be stood before the baboo. "What did Sir Geofrey Farrington pay you for the Pearl of Peri?" "Where did you got the pearl from?" Siti Ram did not answer. Colvin turned to the millionaire. "Will you answer that question, Sir Geofrey?" "What do you mean? The Pearl is my property." The big man spoke roughly. As if in answer, the American's closed hand opened. On his palm rested a wonderful pearl, gleaming under the powerful lights. "The Pearl of Peri was never yours." A slight smile came on the full lips. "Years ago, in Ashanti, it formed one of the twelve jewels of the Collar of Damballa Ouedda—the twelve jewels which symbolised the twelve nations over which the god was destined to rule. It was stolen, and reappeared in Haiti, there decorating the statue indicating the reincarnation of the god. The Collar was again stolen, this time by three known men. One went to London; one went to New York. The third fled to Australia—to Sydney. But with these three men went only three of the twelve jewels." "What became of the others—the remaining nine jewels?" asked the detective inquisitively. Dr. Colvin shrugged. "What has been the history of many famous jewels. They disappear—to reappear—only again to disappear." He turned suddenly to the millionaire. "Do you still claim the Pearl of Peri, Sir Geofrey?" Almost mechanically the millionaire held out his hand. Colvin hesitated a moment, then advanced to wards the millionaire. Suddenly his hands moved like a flash of light. They closed over Sir Geofrey's wrists; then the American sprang back to the English detective's side. Sir Geofrey stood in the centre of the room, his wrists encircled by shining handcuffs. "I say, Colvin!" The Inspector sprang forward expostuatingly. "Sir Geofrey—"
"Forgive me." The Secret Service agent lapsed into his usual placid nonchalance. "Frost, I fear there has been a big mistake." "You mean—" The dazed Inspector glanced from the millionaire to the American. "Sir Geofrey Farringdon—." "Shall I name him Royce Mayne, once of New York—once of Haiti?" The full red lips pursed in a delighted smile. "To-night I lied; but the lie was justifiable. I said that one of the three men went to New York. He did not. He went to Chicago. There he came in touch with Geofrey Farringdon, Sir Joyce Farringdon's scallywag son. Just at that time, Sir Joyce died and s search was made for his son, owing to the fact that the millionaire had neglected to make a will disinheriting his son. Mayne got to know of this fact—and Geofrey Farringdon disappeared. It was not difficult for Mayne to substitute for the heir, for the two men had many similar points, and Mayne was informed of his victim's history. A Sir Geofrey came to London to claim his inheritance—Hold him, Frost!" When the small commotion caused by Sir Geofrey's sudden attempt to escape had subsided, Frost looked about him quickly. "Say Colvin, where's Siti Ram?" "Who can hold that baboo." Colvin smiled secretly. "As usual, the coward disappears when there is trouble about. But—" He went to the desk and lifted from the blotting-pad a small bag made of skin. "But he left this." "What on earth's that?" asked the detective, puzzled. "A Voodoo hate-onango." The American smiled, "You see, Frost, Sir Geofrey, or I should say Mayne, saw it before I made the arrest. Perhaps that's why he gave so little trouble. To those who know the meaning of this bag of rubbish even prison and the shadow of the rope is preferable to the mercy of the hideous culte des mortes." Much later that evening, after the preliminaries consigning Royce Mayne to the cell which he was only to leave permanently for the scaffold, Frost asked a question that had puzzled him all day. "Say, Colvin! Siti Ram's an Indian, a baboo. That hate-onango comes from Haiti—its African. The two facts don't agree. How in Hades did Siti Ram become possessed of the thing?" "I left it for him yesterday afternoon, when I visited him, my friend." The American spoke quietly. "Believe me, I had more than a thought that the superstitious article would prove very useful to us—in the hands of a coward."